With ample benefits for skin and hair, this fruit is a must-have in your beauty regimen. Did you know papaya is called the fruit of angels for its heavenly taste? It contains vitamins C & B, fiber and minerals such as magnesium and potassium. The pulp of papaya has often been used as a core ingredient in shampoos and conditioners. Papaya is surely something that could be added to your beauty regime. Here’s how you can use it. Papaya contains vitamin A which is necessary for the daily nourishment of the skin. It not only removes dead cells but also keeps your skin soft and supple. Signs of aging such as wrinkles and fine lines are also delayed by eating papaya or applying a papaya pack. Say goodbye to other skin aging problems with these home remedies. Take 3-4 chunks of over-ripe papaya and mash well. Add a few drops of honey and raw milk to it. Mix well and apply on your face and neck. Let it stay for 15 minutes and then wash off with water. Most teenagers suffer from pimple problem. Not only does it make you look less attractive but also lowers your confidence. You can prevent pimples and reduce their size by using a simple papaya mask. You can also fight pimples with these home remedies. 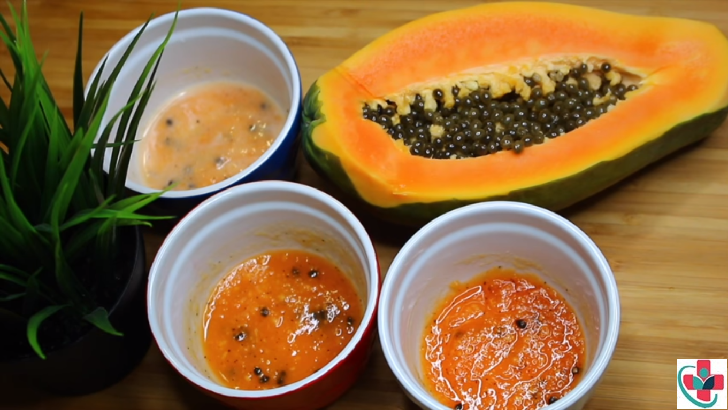 Take 3-4 chunks of raw papaya and make a paste by mashing them. Apply this paste all over the affected areas and let it stay for 20 minutes. Try this twice a week. If you want to lighten spots or remove tan from your skin, papaya mixed with a few other ingredients is handy. It will also moisturize your skin in the process. Mash 3-4 chunks of papaya in a bowl. Add 1 tbsp of lemon juice to it. You can add a few drops of honey too if your skin is sensitive. Mix well and apply on the skin. Dandruff becomes quite common during the winter season. If not treated early, it could damage your hair and lead to hair fall. You can easily control dandruff by using papaya as it has enzymes which can prevent and control the excess buildup of oil and chemicals on your scalp. You can also try these easy home remedies to get rid of dandruff. Mash half a papaya and mix it with half a cup of yogurt. Mix well and apply it on the scalp. You can apply it to your hair as well for shine. Let it stay for 30 minutes after which you can wash off with cold water or a mild shampoo. People who have dry and frizzy hair can switch to a natural conditioner – papaya. Make yourself a nice and healthy hair conditioner at home with the help of papaya. It nourishes your hair by forming a protective layer and also adds shine. Take raw papaya according to the length of your hair. Add 2 tbsp of yogurt and 1 tbsp of olive oil. You can skip the oil if your hair is greasy in texture. Blend together and apply all over the hair after you are done shampooing. Let it stay for 10 minutes and then wash off with lukewarm water.